Today was a zigger-zagger day. Oh, boy. Children were excited, wiggly, having a hard time attending. There were tears, and sharing toys wasn’t an easy thing to do. Some days are just like that. I knew exactly what to do. Alexa to the rescue! Yes, we have ‘Alexa’ in the classroom. We danced up a storm to great music. We had fun! After that, children were happy and relaxed. Music has a magic of its own. 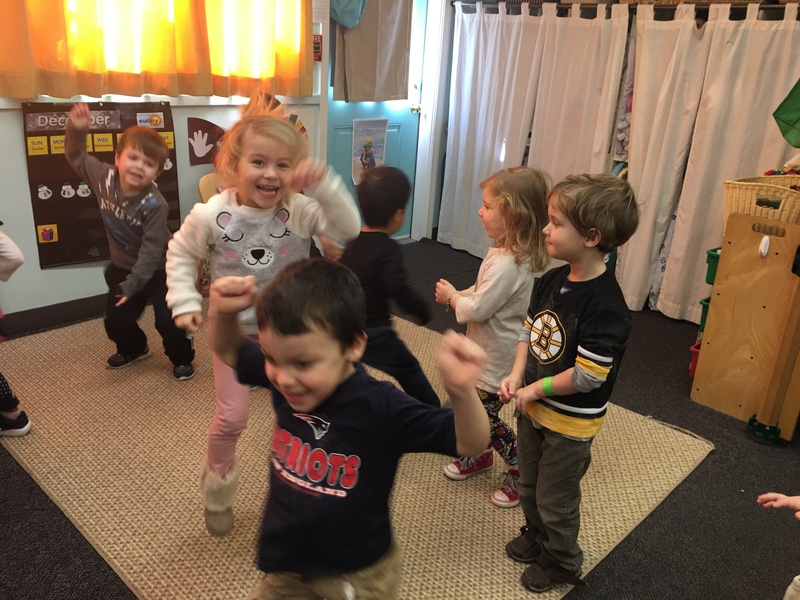 This entry was posted in Early Education, Expressing words and feelings, Inspiration, music, preschool and tagged Children's behavior, Dancing, Dancing to music, Early Education, Paying attention to children, Shout by the Isley Brothers, teaching young children, What children need. Bookmark the permalink. Thanks, Pete. I think it is wonderful that these children love the music I loved ages ago. 🙂 Best to you. The power of music! Never fails! That is so true! On a side note for you Opher, this year children are over the moon about singing “This Land is Your Land”. The biggest music rush in 8 years (and I do lots of using). Big things will be happening in the class room!! Wonderful story and I also know it helps, even for adults. How right Hans Christian Andersen was and is. It really does, Darlene. Thanks so much! Yay for music!!! And singing!!! And dancing!!! Yes, and yes, and yes!!! Nice recovery, Jennie. They had fun, got out their energy, and reconnected. Nothing like music and dancing! Glad you thought so, John. A favorite of mine! Perhaps not so appropriate or PC for your classroom, but just as effective for our family during kiddos growing up years and in need of dealing with the ‘zigger-zaggers’ as you say – our song of choice was “Dizzy Miss Lizzy” covered by the Beatles. Oh and with plenty of popular-at-the-time headbanging by the eldest! Oh, I meant that our family’s choice of song to ‘zigger-zagger’ to wasn’t the most PC for your classroom…HA! I’m more than cool with your classroom ‘activity’! Oh, that’s so funny! I know exactly what you mean. And the number of non-PC songs we played in our family were many – like the Woodstock album. Interestingly, they became memory makers. Our son begged us for the album a few years ago. That was a hard one to give away, but all those non-PC family memories were far more important. Thanks, Laura! You did exactly the right thing. Kids have so much pent-up energy these days, and this is a perfect way to release that happy excitement. What a great idea. I still do this at work when I get frazzled – headphones on – find music – phew. Beautiful! There’s nothing like a bit of musical fun to ease the tensions. So true! Thank you, Norah! Love it! Some friends with small children have that. They love to call out requests to Alexa! Wish you’d been there, Debby! She can be really good for music, and sometimes questions. Today I decided to show children how to ask what words mean the old fashioned way – a dictionary. Wonderful!